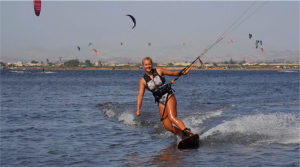 The first basic kiteboarding trick we are going to explain, is how to ride toeside. This is one of the first basics you can learn after riding upwind. Practicing toeside and turns gives you more feeling with the board. You will learn how to turn the board with your body and how you can switch directions quickly. Riding toeside can be useful and fun during a downwinder or a session in the waves. Here we go! Cruise to the side of your choice. Reduce a little bit of speed to give yourself more time. Bring your kite to 11 o’clock (if you are riding towards the left) or to 1 o’clock (if you are riding towards the right). Before you can start the turn of your board you have to shift your bodyweight up and forward. This is just a gentle movement. Move your weight from your back leg towards your front leg. While shifting the weight, keep your balance point (hips) above the middle of the board. Start to turn your board upwind. The turning movement comes from your hips. While turning, let your body work as one. Use head, shoulders and hips to start switching the direction. Look towards the direction you want to go, so your body naturally follows. The start of the toeside switch is the same movement as the start of a transition. Keep pushing the board upwind. Instead of switching direction and ride back, keep on turning the board and move it into toeside with your other leg in front. Again, keep your bodyweight straight above your board to stay in balance. Now you turned the board into a toeside. To keep on riding, engage your abs to keep your upper body in line with your hips and legs. Release the front hand and start to put more pressure on the edge with your toes. To be able to start riding upwind, use your bodyweight by hanging into your harness and press the edge of your toes into the water. Keep on practicing toeside and the most important thing: never forget to smile :-) Good luck!